It’s no secret that we love designing, decorating, and anything to do with party planning and sweet treats, so when Best Friends for Frosting decided to feature our Top 5 favorite cupcake shops, we were ecstatic! 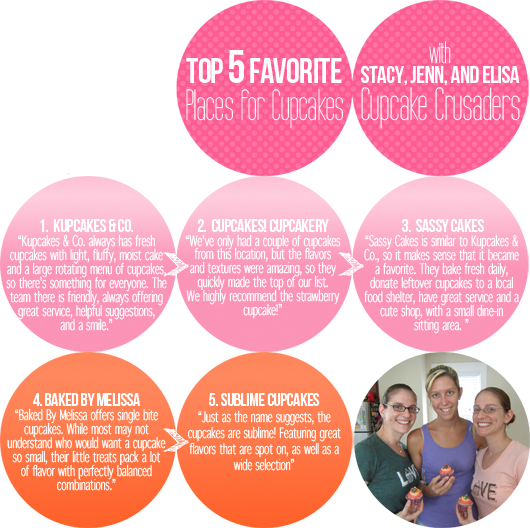 Choosing a Top 5 isn’t easy, and when it has to be agreed upon by three hard-core cupcake lovers, it’s even harder! But tasked with the challenge we created this list for Best Friends for Frosting’s readers. Check it out! 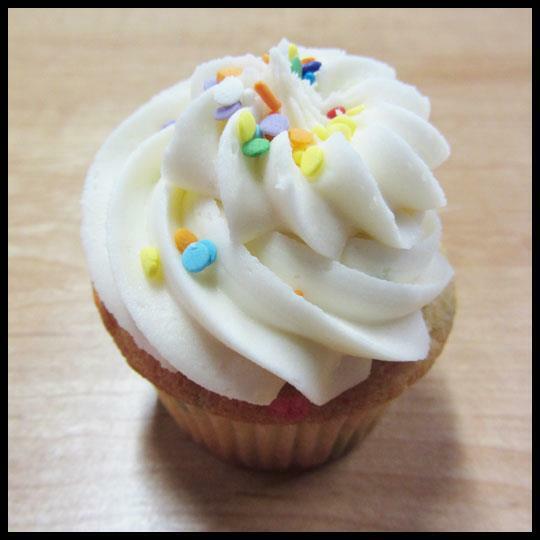 Big “THANKS!” to the team at Best Friends for Frosting for including us on their website! For more information on Best Friends for Frosting visit their website and Facebook page. Every Tuesday through the month of March we began counting down our Top 5 favorite cupcake places outside of Baltimore City and today, we are finally at #1! In order to make sure we did the proper research and included places that would “qualify” we decided that any place that was within a 45 minute drive from the Baltimore City boundary would be included. If you don’t see a place that you think should have been featured in our Top 5 let us know! We do our best to research where the cupcakes are, but there is no better way to find out than a recommendation! 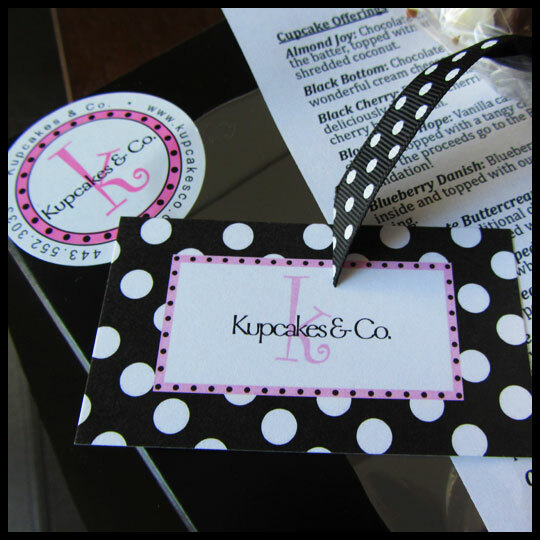 We can’t say enough great things about Kupcakes & Co., located off Meadowridge Road in Elkridge, MD. Their little shop (which you can find around the back of a small shopping center) is stylishly decorated in their signature pink and black and features a custom built cupcake display case. We instantly fell in love with Kupcakes & Co. during our first visit to their shop for Kupcakes with Santa. Not only did they “wow” us with their amazing cupcakes, but their hospitality was, and has always been, top-notch. It’s no wonder you often find a line going the entire length of the store, or even out the front door. But don’t let that deter you. They’ve got a great system down and you won’t have to wait long! This cupcake represents the classic fluffernutter sandwich that combines marshmallow fluff and peanut butter. You can actually see each of those components swirled in the frosting. It is also topped with a marshmallow dipped in peanut butter, which is a cleaver addition. Trying to slowly savor this cupcake was no small feat because it was so good it had me rushing to get to the next bite. Breakfast flavored cupcakes may not be a new concept in the cupcake world (Anyone familiar with the maple-bacon craze? Kupcakes & Co. has that too!) but this twist on a standard breakfast favorite has me wishing it was okay to eat cupcakes everyday for breakfast. The blueberry cake blends with their amazing cream cheese frosting to perfectly represent an actual blueberry danish. 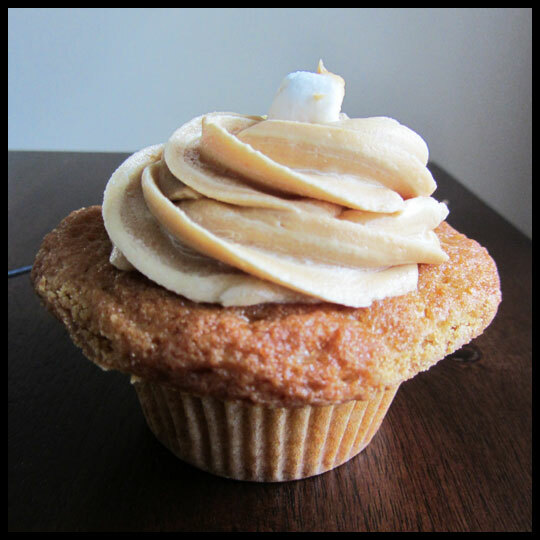 I haven’t had the opportunity to try this peanut butter banana cupcake, but Crusader Jenn recommends this one and says that it is, “So moist and delicious.” I’ll definitely be getting it on my next visit! 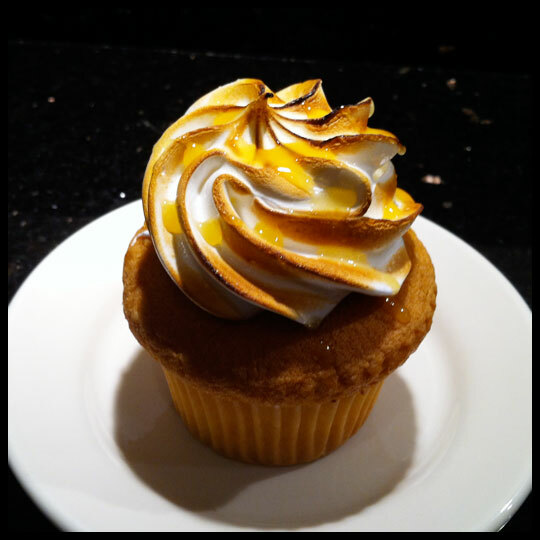 This cupcake has a lemon curd filling with a meringue topping and tastes just like a slice of lemon meringue pie, but with the added bonus of deliciously moist cake. My husband loves lemon meringue pie, so I’ll have to pick one of these up for him on my next visit too! Every Tuesday for the month of March (and the first week in April) we will be counting down our Top 5 favorite cupcake places outside of Baltimore City. In order to make sure we did the proper research and included places that would “qualify” we decided that any place that was within a 20 to 45 minute drive from the Baltimore City boundary would be included. If you don’t see a place that you think should have been featured in this Top 5 let us know! We do our best to research where the cupcakes are, but there is no better way to find out than a recommendation! 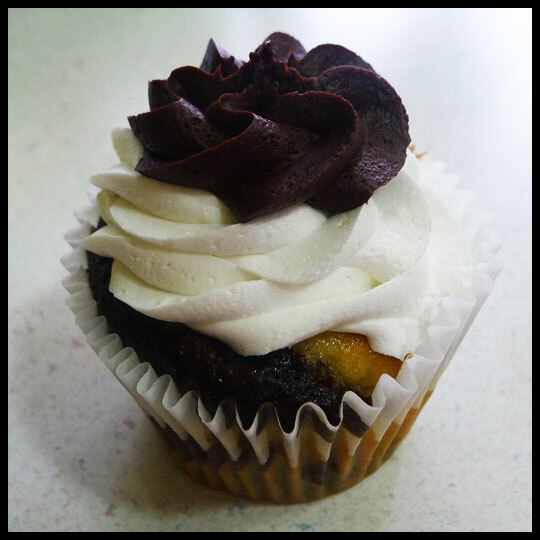 I’ve been enjoying Starry Night Bakery and Coffeehouse’s cupcakes for quite a while now, located in Westminster, MD. They made it to the final round on the Food Network’s Cupcake Wars due to their creative flavors and fun designs. Aside from cupcakes, they also have a full coffee shop of inventive beverages, cakes, cookies, and other pastries. When we decided to do a Top 5 of the Baltimore suburbs, I knew I wanted them to be on the list. That was my cue to make sure that the other Crusaders had a taste of what makes Starry Night so exceptional! One of the fun things about Starry Night is their quirky side…hence the name for their specialty cupcakes, or “Quirky Cupcakes.” This quirkiness starts with the cupcakes and cakes, but then spreads throughout the shop, with fun décor, including hand-painted murals on the wall. I love a place where I can grab a cup of coffee and sweet treat with a friend, and just sit and feel “cool.” And, Starry Night is that sort of place. Another great thing about Starry Night is their social media activity. New flavors are posted on their Facebook page, along with photos, and special offers for their Facebook followers. Although their website can be hard to navigate, they’ve used Facebook to its fullest and I often find myself going to pick up a new flavor or take advantage of a special offer they’ve posted about. We’ve reviewed Starry Night cupcakes many times. A couple of our favorites have been the seasonal Cinnamon Chip, which is unfortunately no longer available for the spring, and the Mahoo Wahoo, which you can usually find and was one of their Cupcake Wars creation. 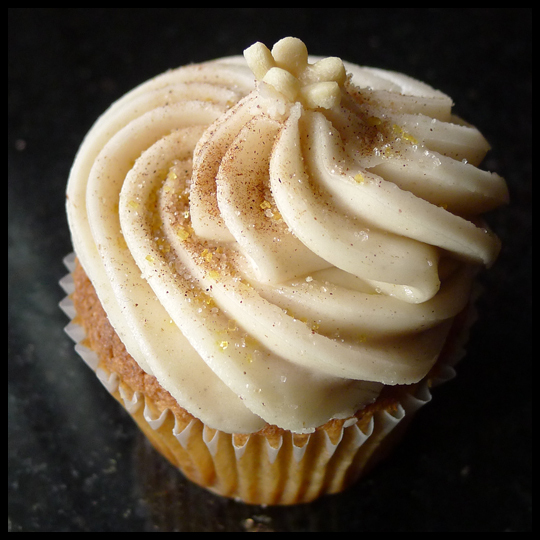 This cupcake was so moist and packed a great cinnamon sugar punch. 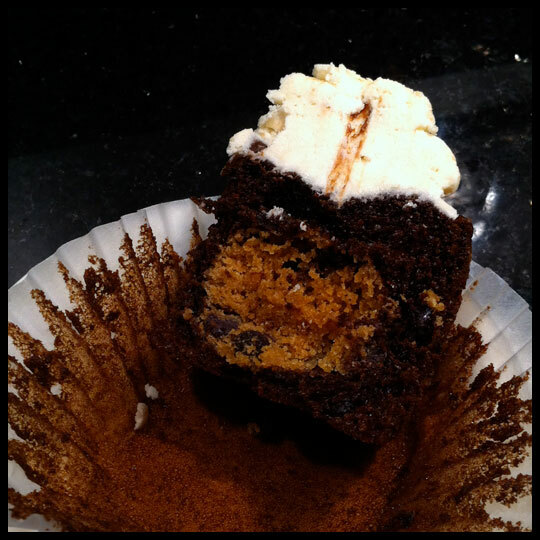 I don’t know how they created a cinnamon chip…maybe some sort of streusel…but I can’t stress enough how amazing this cupcake was. While having the cinnamon flavor you’d expect from a cinnamon roll or muffin, it still maintained a cupcake quality, which I loved about it. 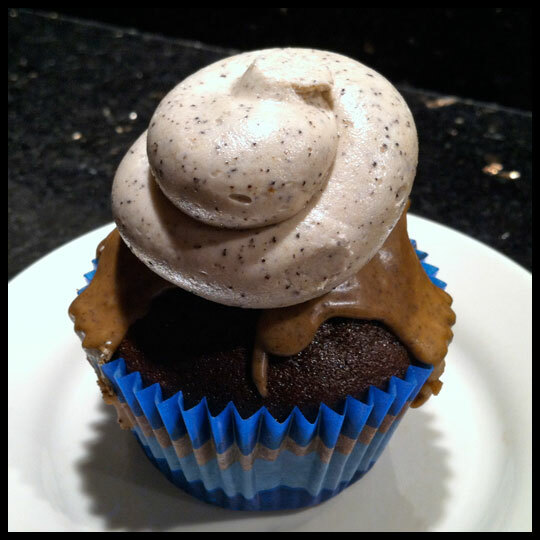 This cupcake uses Kona Coffee and is a chocolate cake with coffee drizzle glaze and coffee buttercream. 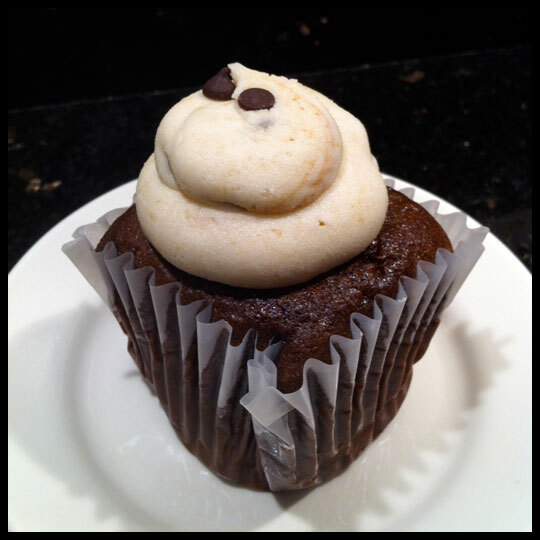 If you like coffee and you like it strong, as I do, then this is the cupcake for you! Paired with the chocolate it’s a match made in heaven. With the friendly staff, specialty desserts, coffee, wedding cake tastings, and of course THE CUPCAKES, Starry Night has become a favorite place for the Crusaders to visit. For these reasons they have taken our #2 spot on our Top 5 list! With all the competition and all the cupcakes we’ve tasted to compile the Top 5, Starry Night has proven to be a front-runner in the industry with their creativity and enthusiasm. Although their standard cupcake flavors are not the stars, their “Quirky Cupcakes” are well worth the visit. 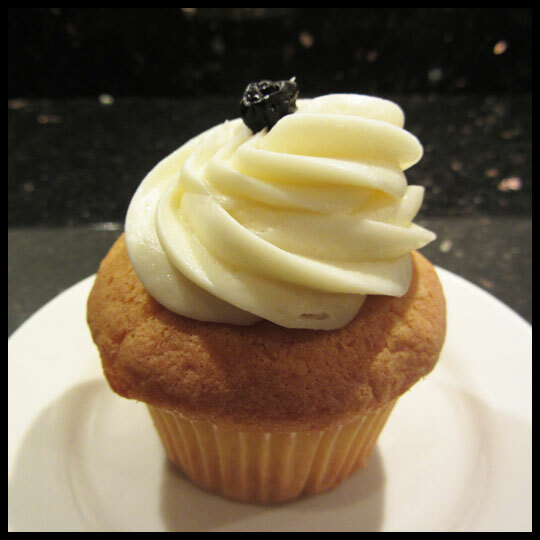 If you are in the Westminster area, or just a fan of Cupcake Wars, please take some time to grab a cupcake and a specialty drink from Starry Night! IcedGems Dessert Creations storefront located in Reisterstown, MD and boasts an array of sugary bliss Tuesday through Saturday (and Sunday in the warmer months). You can stop by and grab a cookie, whoopie pie, cake truffle, or, of course, a cupcake! While I have not had the pleasure of stopping by the store in Reisterstown, us “city folk” are lucky enough to have their Cupcake Truck to follow around Baltimore city! They post the truck schedule well in advance on their Facebook page and stop at locations all over the city. 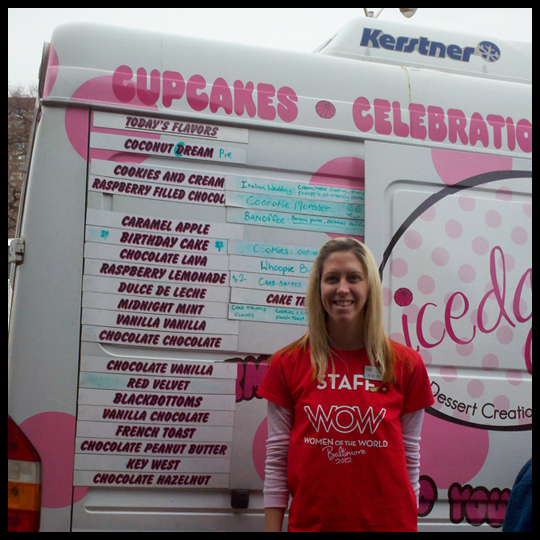 Recently they participated in the WOW – Women of the World festival and were parked in front of the Meyerhoff for two days, where I finally got to meet up with the truck and its delicious confections. My first IcedGems experience was a couple of months ago when a co-worker brought back a Red Velvet that the staff had given to her just for me (see post). For me, it was love at first bite! Since that fateful moment, I have had the pleasure of eating almost every flavor IcedGems has to offer, below are a few of the Crusaders favorites. Breakfast in cupcake form = maple/cinnamon/cake heaven. Rarely do you find a cupcake that tastes exactly like the “meal” it is meant to represent, but this one does so perfectly! The cake’s flavor is so perfect that I think sometimes it must have been dipped in an egg and cinnamon mixture and cooked in a frying pan. The maple icing is divine and just the right amount of sweetness for the moist and savory cake. This very delicious cupcake was a special for IcedGems Valentine’s Dozen – and this was the standout cupcake of the bunch. The “brut” cake was moist and had the perfect hint of tangy champagne, while the strawberry icing was fresh and sweet. I hope to see this on their menu more often as it is a fantastic cupcake that stands out in my mind as one of my all time favorites. My love/hate relationship with red velvet is no secret: the ups, the downs, the disasters, and the beautiful successes. IcedGems Red Velvet is moist, rich, decadent without being overly so, and truly has that red velvet flavor that is so hard to attain. Their cream cheese icing is a delicate balance of sweet and cheesy. 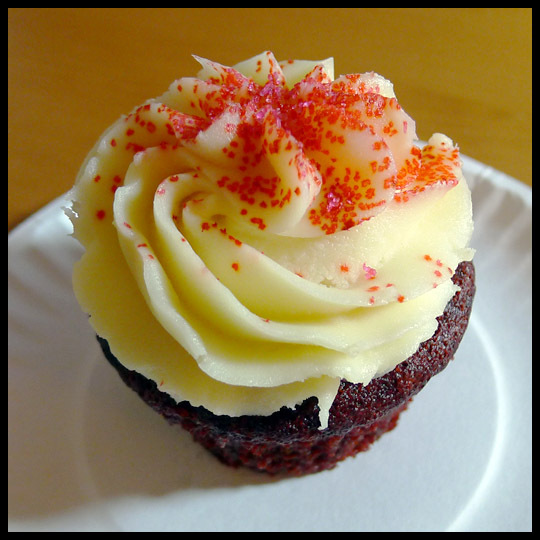 For me, this red velvet reigns supreme among all others in the Baltimore area. Overall the Crusaders have enjoyed IcedGems cupcakes and they take the #3 spot on our Top 5! While you might encounter a dry cupcake here or there, they are definitely a shop – or in my case, a truck – to track down and visit. The friendly staff will help you pick out flavors and sweets that are sure to satisfy your sugary craving. During our research to find our Top 5 places outside of Baltimore City, we came across Touché Touchet Bakery and Pastry Shop located in Columbia, MD. Touché Touchet creates beautiful cakes, cupcakes, sugar cookies and even makes savory pastries and delicious coffee for those who might be looking for something to go with their sweet treat of choice. Since it isn’t located in the shopping/restaurant hub of Columbia, we had never been there before. On the day we visited Touché Touchet, we had the pleasure to be accompanied by my sister and her two adorable daughters. Our niece, Lylah, is 2 years old and already showing signs of being a little cupcake connoisseur. (Lylah enjoying a basic vanilla cupcake with chocolate frosting. Her technique is still a bit questionable, but her enthusiasm makes up for it). As you can see in the above photo, Touché Touchet has a great little seating area complete with table lamps and adorable cupcake table clothes. 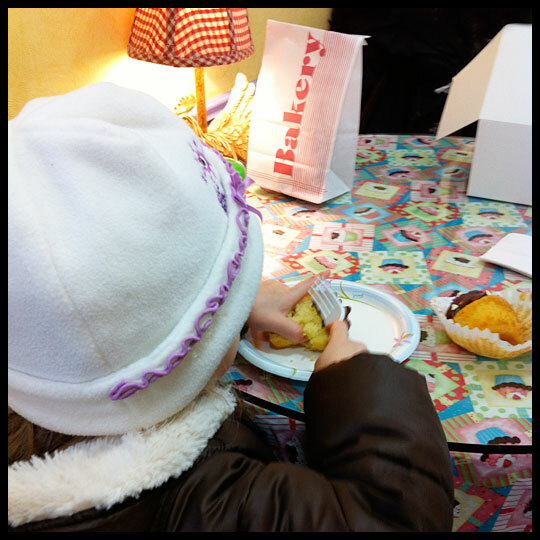 Seating areas are a great bonus to any bakery or cupcakery, especially when you’ve got the little ones with you. 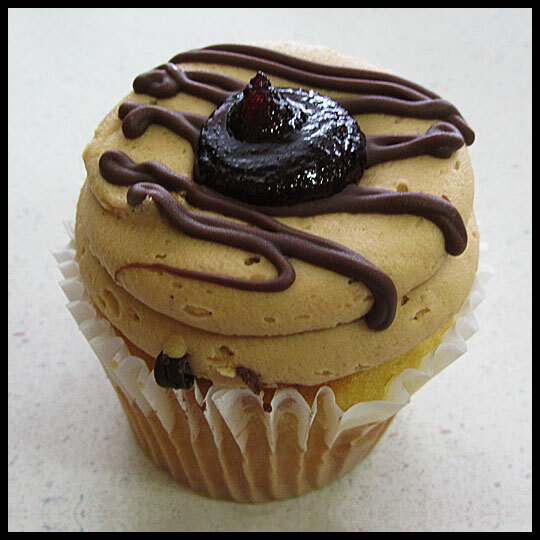 I’m a big fan of PB&J cupcakes, but before trying this one at Touché Touchet I had only found one other that I really loved. To me, there is something special about taking two nostalgic foods and combining them together. 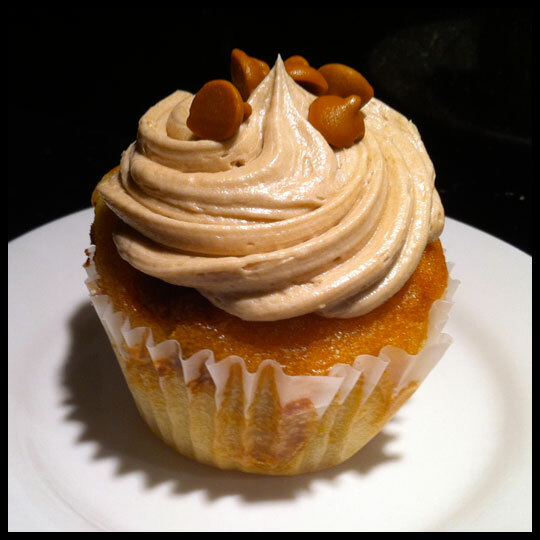 The peanut butter frosting was rich, light, creamy, and not too sweet. Then, the dollop of tart raspberry jam you see on top was only the tip of the iceberg. I’ve never seen so much filling inside of a cupcake before! 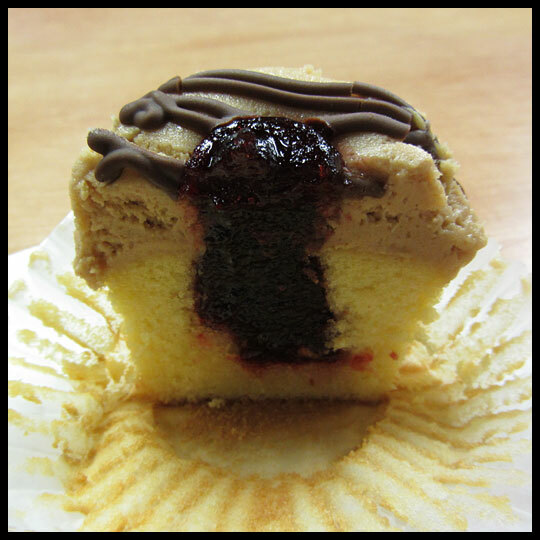 Normally it’s just enough to give a little surprise, but the filling in this cupcake ensures you get the full PB&J experience with every bite. Like the Peanut Butter and Jelly, Chocolate Raspberry is another favorite flavor of mine. So much so, that I rarely encounter anything with this mixture that I’m not a fan of, but this cupcake makes others look insignificant. 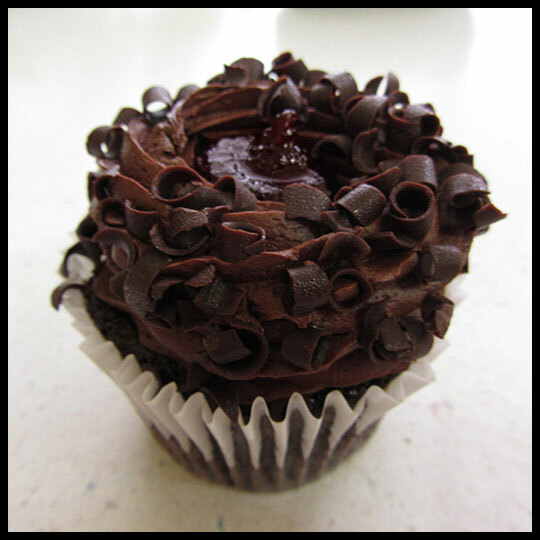 It may be a contender for my ultimate favorite Chocolate Raspberry cupcake. The filling was the same featured in the Peanut Butter and Jelly, but instead paired with decadent, moist, and chocolatey cake and frosting. 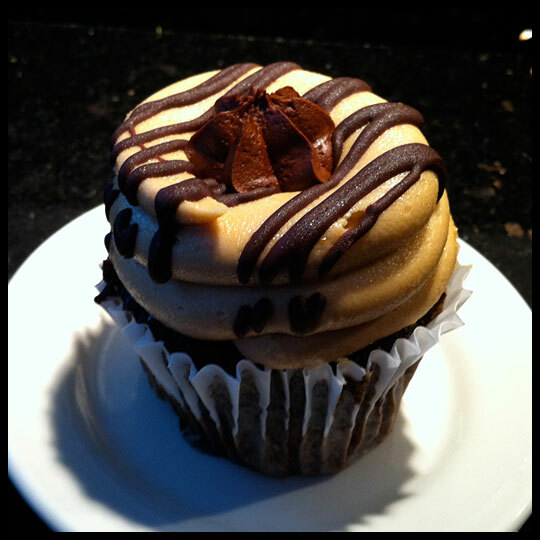 Jenn ordered this cupcake and said that it uses the same great cake from the Chocolate Raspberry and the smooth, creamy peanut butter frosting from the Peanut Butter and Jelly to create a deliciously classic cupcake. 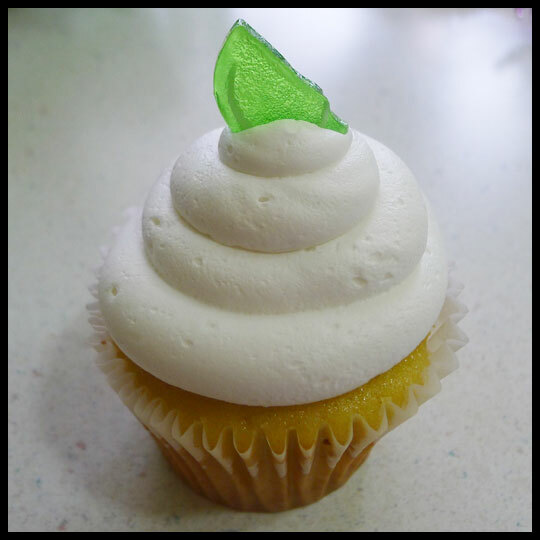 This Key Lime cupcake was one of Elisa’s two selections. She said that it was moist and sweet, with a subtle key lime flavor. Elisa typically prefers a citrus flavored cupcake which has the flavoring in the cake or the icing (or both) and not just in a filling, like this cupcake. However, once she got to the filling, it all came together for her and she thought the key lime flavor was very nice and worked well with the vanilla cake and the light, sweet, icing. Overall we really enjoyed our time at Touché Touchet. The atmosphere and the cupcakes were both great and are the reason why this “new-to-us” shop has taken the #4 spot on our Top 5 list. While it might not be in a super convenient location for any of the Crusaders, I hope to return and enjoy more cupcakes with a cup of coffee in their quaint seating area. And who knows, after more visits, maybe they will move up our Top 5 list? If you are in the Columbia area, we would highly recommend stopping by Touché Touchet the next time you are on the hunt for some tasty, large, gourmet cupcakes! We are excited to introduce our next series! 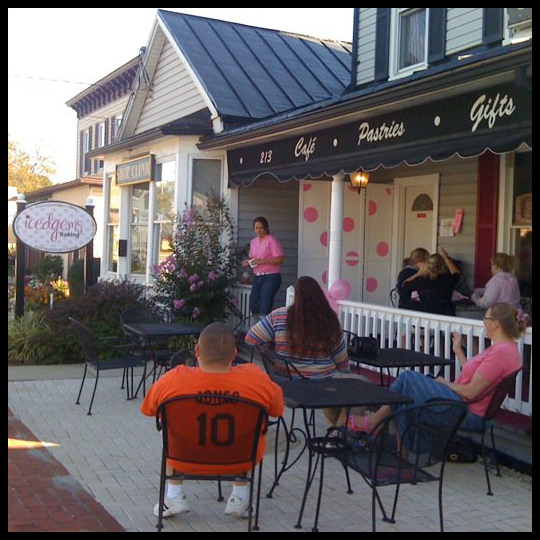 Every Tuesday for the next 5 weeks we will countdown our Top 5 favorite cupcake places outside of Baltimore City. In order to make sure we did the proper research and included places that would “qualify” we decide that any place that was within a 20 to 45 minute drive from the Baltimore City boundary would be included. If you don’t see a place that you think should have been featured in this Top 5 let us know! We do our best to research where the cupcakes are, but there’s no better way to find out than a recommendation! 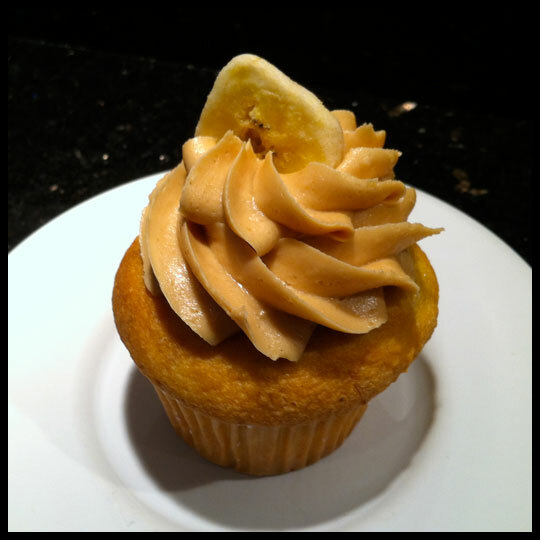 Our 5th favorite cupcakery located outside of Baltimore City is Fresh Bakery. Fresh Bakery is currently stationed in the food court at the Owings Mills mall, but they used to have several kiosks spread out in malls around the outskirts of Baltimore City. My first experience with them, almost 2 years ago, was at one of those kiosks located in Towson Town Center. I randomly stumbled upon it on a shopping trip and ended up going home with four of their deliciously square (yep, they are square!) cupcakes. After my first taste of these cupcakes, I was amazed at how moist and full of flavor they were. Each one of them was unique, yet wonderful. Fresh Bakery’s only downside is their location. While they used to be housed in several shopping centers (Arundel Mills, Columbia, and Towson Town Center), they are now only located in the Owings Mills mall. For anyone who has been there recently, you know that this mall doesn’t have a lot to offer. It seems to be slowly closing down so there are very few stores and food options remaining. This means that you will most likely have to make a separate trip there just for these cupcakes. 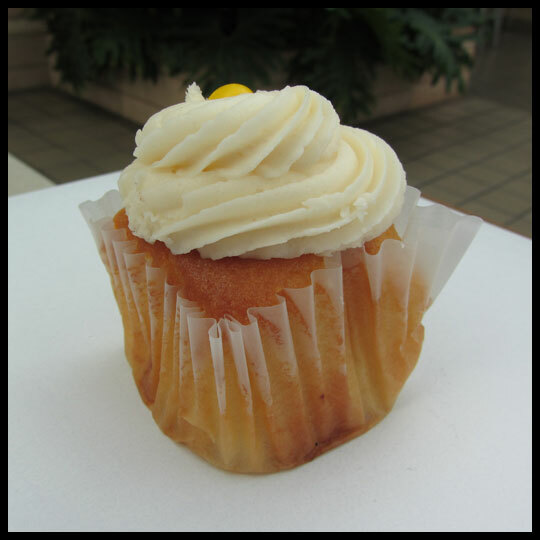 When they were placed throughout several great malls, their cupcakes were the perfect end to a successful (or not-so-successful) shopping excursion. Over time, the Crusaders and I have had many encounters with Fresh Bakery’s cupcakes and I have never had a bad experience with any. We do have our favorites though, so for now we are going to focus on just a few that we would highly recommend to anyone. By now most of you probably know about my growing fascination with vanilla cupcakes. Some may find them boring, but I think they are a great classic when done well and Fresh Bakery knows how to make this classic a standout. There is an intense vanilla flavor that creates a total birthday party in your mouth. The cake is also very airy and moist which is a great contrast to the thick creamy frosting. 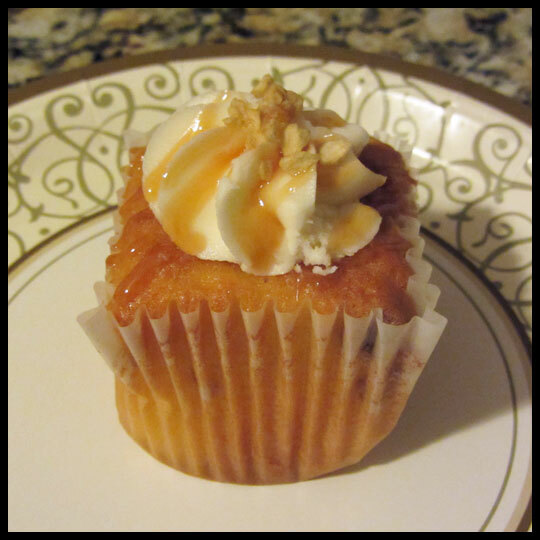 You can’t really go wrong when apples and caramel are paired together, and this cupcake is no exception. The sweet caramel melded into the moist cake which was brimming with perfectly cooked apples. I’d rather have this cupcake than actual apple pie any day. I’m a big fan of cookie dough straight from the bowl (or a store bought container…), so this cupcake combines two of my favorite things. The cookie dough isn’t just a light sprinkling throughout the cake or frosting, instead there is a big ball of it baked right in the center. Look at all that wonderful cookie goodness! You might think that the frosting would play second fiddle to the awesomeness of the cookie dough in the cake, but that’s not the case at all. The frosting itself manages to taste exactly like cookie dough too! 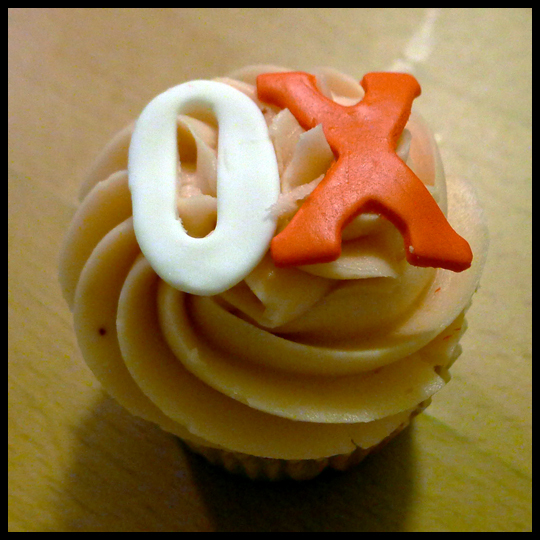 I don’t know how they do it, but if you get a chance, you must experience this cupcake for yourself. 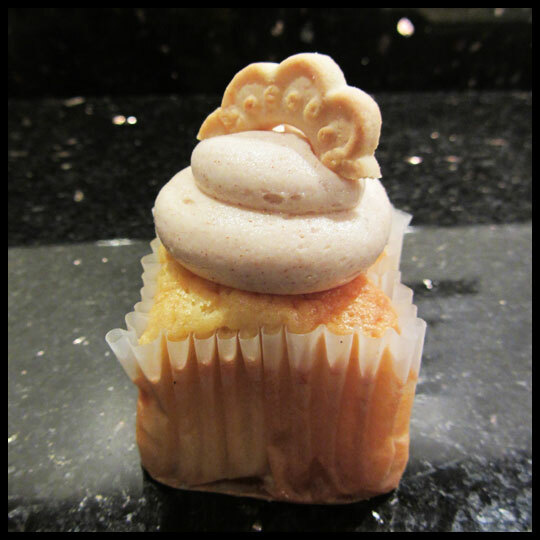 I’ve had some really tasty snickerdoodle cupcakes recently, and this is one of them. Sweet, moist and packed with cinnamon flavor. You really can’t ask for more from this tiny treat. It is a definite must try. 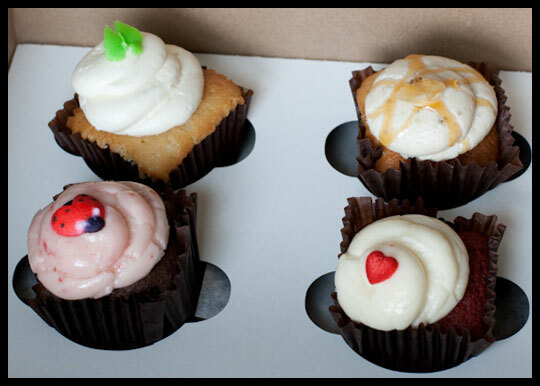 Despite the less than perfect location, Fresh Bakery provides creative and mouth watering square cupcakes. If the shape isn’t already unique enough, their flavor combinations always make me want to return to try something I haven’t already tried. But they have also proven that even though they can go over the top, they can also keep it simple and cater to those who prefer the more classic flavors. So whether you are looking for something different or an old fashioned standard, Fresh Bakery delivers.